Not to be confused with EUPOL. The European Union Agency for Law Enforcement Cooperation, better known under the name Europol, formerly the European Police Office and Europol Drugs Unit, is the law enforcement agency of the European Union (EU) formed in 1998 to handle criminal intelligence and combat serious international organised crime and terrorism through cooperation between competent authorities of EU member states. The Agency has no executive powers, and its officials are not entitled to arrest suspects or act without prior approval from competent authorities in the member states. Seated in The Hague, South Holland, it comprised 1,065 staff in 2016. [...] Member States shall regard the following areas as matters of common interest: [...] police cooperation for the purposes of preventing and combatting terrorism, unlawful drug trafficking and other serious forms of international crime, including if necessary certain aspects of customs cooperation, in connection with the organization of a Union-wide system for exchanging information within a European Police Office (Europol). 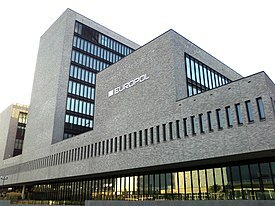 Europol was first de facto organised provisionally in 1993 as the Europol Drugs Unit (EDU) in Strasbourg at the same site as the Schengen Information System was hosted. The small initial group started operations there in January 1994 under the leadership of Jürgen Storbeck and with a mandate to assist national police forces in criminal investigations. The competition for the permanent site of Europol during the period was between The Hague, Rome and Strasbourg—the European Council decided on 29 October 1993 that Europol should be established in The Hague. A former Catholic boys school built in 1910 at Raamweg 47 was chosen as the precise location. The house was used in World War II by police and intelligence agencies and after the War manned by the Dutch State Intelligence Service until Europol relocated there later in 1994. 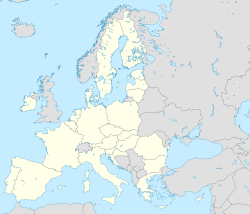 The Europol Convention was signed on 26 July 1995 in Brussels and came into force on 1 October 1998 after being ratified by all the Member States. The European Police Office (Europol) commenced its full activities on 1 July 1999. Europol was fully integrated into the European Union with Council Decision 2009/371/JHA of 6 April 2009. It replaced the Europol Convention and reformed Europol as an EU agency (i.e. subject to the general rules and procedures applicable to all EU agencies) on 1 January 2010 due to different aspirations, such as enhanced support to Member States on countering serious and organised crime, budgetary control by the European Parliament, and administrative simplification. The Agency's new 32 000 m2 headquarters building, designed by Frank Wintermans, was opened by Queen Beatrix of the Netherlands on 1 July 2011 in the international zone of The Hague next to the International Criminal Tribunal for the former Yugoslavia (ICTY) and the Organisation for the Prohibition of Chemical Weapons (OPCW) at Eisenhowerlaan 73. On 11 January 2013, Director Rob Wainwright and European Commissioner for Home Affairs Cecilia Malmström launched the European Cybercrime Centre (EC3 or EC³), a unit of Europol tasked with assisting Member States to dismantle and disrupt cybercrime committed by organised groups to generate large criminal profits (e.g. online fraud), causing serious harm to victims (e.g. online child sexual exploitation) or affecting critical infrastructure and systems in the EU. The purpose of the Centre is to coordinate cross-border law enforcement activities against cybercrime and act as a centre of technological expertise, such as tool development and training. Commissioner Malmström stated that the need for a cybercrime centre in Europe was "to protect the open and free internet". On 25 January 2016, the European Counter Terrorism Centre (ECTC) was launched as a new strategic platform within Europol to share information among EU states in tracking movements of Europeans into and from Syria as well as to monitor terrorists' finances and militants' Internet usage. When the UK exercised its opt-out from the area of freedom, security and justice in 2014, its request to continue participating in Europol was approved. The European Parliament approved Europol's new legal framework, Regulation (EU) 2016/794, on 11 May 2016 after three years of negotiations and thus repealed the former Decisions of 2009. The new framework granted additional powers on counter-terrorism to Europol, but also includes adding training and exchange programmes for staff, creating a solid data protection system, and strengthening the Parliament's control over the Agency. The Regulation took effect on 1 May 2017. Additionally, the full name was amended to European Union Agency for Law Enforcement Cooperation (Europol). Denmark was not permitted to participate in the 2016 recast Europol Regulation due to its opt-out from the Area of freedom, security and justice. In a December 2015 referendum it rejected converting its opt-out to a case-by-case opt-in, which would have allowed it to participate in the new regulation and remain a member of Europol. However, Denmark and the European Union agreed on a co-operation deal in December 2016. The agreement was accepted by both the European Parliament and the Danish Parliament on 27 April 2017 and subsequently signed on 29 April 2017—two days before Denmark would have been cut off from the Agency. The UK also did not originally participate in the recast 2016 Europol Regulation, but subsequently notified the EU of its desire to participate in December 2016. Its participation was confirmed by a Commission Decision in March 2017. In September 2017, it was reported that the United Kingdom was planning to hold onto Europol access, such as intelligence sharing and co-operation in fighting crime and terrorism, after Brexit though a new treaty. However, the EU’s chief negotiator Michel Barnier said in November 2017 that the UK "will no longer be a member of the European Defence Agency or Europol" after Brexit takes effect. Europol started the Stop Child Abuse – Trace an Object campaign and website on 31 May 2017. The site's objective is to display objects in child sexual abuse images to try to find the perpetrators and victims — in the hope that distinct details, such as a logo on a bag or a shampoo bottle, can be identified by the public who can then forward the information by an anonymous tip-off or social media. The approach was called crowdsourcing by the investigators. Bellingcat, the investigative search network, reported that several objects had been positively identified following its attempt to support Europol's call. Europol is mandated by the European Union (EU) to assist EU Member States in the fight against international crime, such as illicit drugs, trafficking in human beings, intellectual property crime, cybercrime, euro counterfeiting and terrorism, by serving as a centre for law enforcement co-operation, expertise and criminal intelligence. Europol or its officials do not have executive powers — and therefore they do not have powers of arrest and cannot carry out investigations without the approval of national authorities. Europol reported it would focus on countering cybercrime, organized crime, and terrorism as well as on building its information technology capacities during the 2016–2020 strategy cycle, . Europol likewise stated that the previous strategy cycle of 2010–2014 laid the foundation for the Agency as the European criminal information hub. The EU Serious and Organised Crime Threat Assessment (SOCTA) of 2017 identified eight priority crime areas: cybercrime; drug production, trafficking and distribution; migrant smuggling; organised property crime; trafficking in human beings; criminal finances and money laundering; document fraud; and online trade in illicit goods and services. Additionally, the Agency's tasked activities in detail include analysis and exchange information, such as criminal intelligence; co-ordination of investigative and operational action as well as joint investigation teams; preparation of threat assessments, strategic and operational analyses and general situation reports; and developing specialist knowledge of crime prevention and forensic methods. Europol is to coordinate and support other EU bodies established within the area of freedom, security and justice, such as the European Union Agency for Law Enforcement Training (CEPOL), the European Anti-Fraud Office (OLAF), and EU crisis management missions. The Agency is also directed to assist the European Council and the European Commission in developing strategic and operational priorities. The Europol Directorate, day-to-day leadership of the Agency, is appointed by the EU Justice and Home Affairs Council (JHA) for four-year terms. As of 2018, the Agency is headed by Executive Director Catherine De Bolle. The Agency is accountable to and controlled by the Justice and Home Affairs Council. Together with the European Parliament, the Council approves Europol's budget and regulations related to its work. The Council forwards an annual special report to the European Parliament on the work of the Agency — and the Parliament also discharges Europol from its responsibility for managing a set budget. Before 2009, the Agency was an international body and thus the European Parliament lacked effective scrutiny powers over it. From 2009 to 2017, the European Parliament had been the sole organ in parliamentary control of Europol. The Joint Parliamentary Scrutiny Group (JPSG) was created at the EU Speakers Conference in Bratislava on 23-25 April 2017 to allow both the European Parliament and national EU parliaments to exert control over Europol. The Europol Management Board comprises representatives from all of the Member States and from the European Commission, each having one vote. Decisions of the Board require a supermajority and it meets at least twice per year on Europol's current and future activities as well as on adopting the budget, programming material and general annual reports. The Board forwards its decisions to the Justice and Home Affairs Council for the Council's perusal. The Management Board functions include data protection, internal audit and accountancy. External financial oversight of the Agency is conducted by the European Court of Auditors (ECA); for example, ECA evaluated Europol in 2017 on anti-radicalization programmes. Internal control is carried out by the Internal Audit Service of the European Commission as well as by the Europol Management Board-appointed Internal Audit Function. The European Ombudsman is tasked with investigating complaints against EU institutions and bodies, including Europol, as well as assisting to create a more transparent, effective, accountable and ethical administration. As of 1 May 2017, the European Data Protection Supervisor (EDPS) has been responsible for supervising the Agency's data protection measures. The Director of Europol is able to enter into agreements for Europol with other countries and international organizations. As of September 2017, Europol co-operates on an operational basis with Albania, Australia, Bosnia and Herzegovina, Canada, Denmark, Colombia, Georgia, Iceland, Liechtenstein, Moldova, Monaco, Montenegro, North Macedonia, Norway, Serbia, Switzerland, Ukraine and United States of America and Interpol. Similarly, the Agency has strategic agreements with Brazil, China, Russia, Turkey, United Nations Office on Drugs and Crime (UNODC) and World Customs Organization (WCO). ^ a b "Statistics & Data". europol.europa.eu. Europol. Archived from the original on 30 August 2017. Retrieved 18 September 2017. ^ a b Statement of revenue and expenditure of the European Police Office for the financial year 2017 (2017/C 84/35) (PDF). Europol. 2017. Archived (PDF) from the original on 18 September 2017. ^ "Luxembourg European Summit - Conclusions of the Presidency (SN 151/3/91)". www.europarl.europa.eu. European Parliament. June 1991. Archived from the original on 11 June 2017. Retrieved 22 September 2017. ^ a b Bunyan, Tony (1993). "Trevi, Europol and the European state". In Bunyan, Tony (ed.). Statewatching the New Europe: Handbook on the European State. Statewatch. CiteSeerX 10.1.1.175.888. ISBN 978-1874481027. ^ a b c 1998-2016 Looking Back, Moving Forward: One Hundred Meetings of the Europol Management Board (PDF). Luxembourg: Publications Office of the European Union. Europol. 2016. ISBN 978-92-95200-73-9. Archived (PDF) from the original on 22 September 2017. ^ a b c d Ten Years of Europol, 1999-2009 (PDF). The Hague: Europol. 2009. Archived (PDF) from the original on 22 September 2017. ^ a b c "Europe's intelligence 'black hole'". POLITICO. 3 December 2015. Archived from the original on 17 September 2017. Retrieved 22 September 2017. ^ "Maastricht European Summit - Conclusions of the Presidency (SN 271/1/91)". www.europarl.europa.eu. European Parliament. December 1991. Archived from the original on 11 June 2017. Retrieved 22 September 2017. ^ "Treaty on European Union, signed at Maastricht on 7 February 1992". Official Journal of the European Communities. 35. 29 July 1992. ISSN 0378-6986 – via EUR-Lex. ^ Rijksvastgoedbedrijf (27 September 2016). "Den Haag, Raamweg 47". www.rijksvastgoedbedrijf.nl (in Dutch). Archived from the original on 22 September 2017. Retrieved 21 September 2017. Office in classical school building from 1910. This office building was used by Europol until 2011. ^ "Convention drawn up on the basis of Article K.3 of Treaty on European Union, on the establishment of a European Police Office (Europol Convention)". EUR-Lex. Official Journal of the European Communities. 26 July 1995. Retrieved 20 September 2017. ^ "Agreement Details - Europol Convention". www.consilium.europa.eu. Council of the European Union. Retrieved 20 September 2017. ^ a b c d Shaw, Danny (15 February 2017). "Inside Europol". BBC News. Archived from the original on 23 September 2017. Retrieved 22 September 2017. ^ "Council Decision of 6 April 2009 establishing the European Police Office (Europol) (2009/371/JHA)". Official Journal of the European Union. L (121). 15 May 2009. Retrieved 20 September 2017 – via EUR-Lex. ^ Wolff, Sarah (2009). From The Hague to Stockholm: The Future of EU's Internal Security Achitecture and Police Cooperation (PDF). The Hague: Netherlands Institute of International Relations Clingendael. Archived (PDF) from the original on 23 September 2017. ^ "HM Queen Beatrix of the Netherlands opens new Europol headquarters in The Hague". Europol. 1 July 2011. Archived from the original on 21 September 2017. Retrieved 20 September 2017. ^ "Europol Special" (PDF). SMAAK. July 2011. Archived (PDF) from the original on 4 July 2016. ^ "European Cybercrime Centre (EC3) opens on 11 January". europa.eu. European Commission. 9 January 2013. Archived from the original on 23 June 2017. Retrieved 21 September 2017. ^ "European Cybercrime Centre - EC3". Europol. Archived from the original on 24 September 2017. Retrieved 21 September 2017. ^ "EU cybercrime centre launched by Commissioner Malmström". news.bbc.co.uk. BBC. 9 January 2013. Archived from the original on 10 January 2013. Retrieved 13 January 2013. ^ Ashford, Warwick (11 January 2013). "European Cybercrime Centre opens in The Hague". ComputerWeekly.com. Computer Weekly. Archived from the original on 13 January 2013. Retrieved 13 January 2013. ^ "Speech: EC³, a European response to cybercrime". europa.eu. 11 January 2013. Archived from the original on 23 June 2017. Retrieved 21 September 2017. ^ Macdonald, Alastair (20 November 2015). "EU's Europol in action against Paris attackers - chief". Reuters. Archived from the original on 21 September 2017. Retrieved 20 September 2017. ^ (www.dw.com), Deutsche Welle (25 January 2016). "Europol launches pan-European counterterrorism center". DW.COM. Retrieved 20 September 2017. ^ "Council Decision of 27 November 2014 determining certain consequential and transitional arrangements concerning the cessation of the participation of the United Kingdom of Great Britain and Northern Ireland in certain acts of the Union in the field of police co-operation and judicial cooperation in criminal matters adopted before the entry into force of the Treaty of Lisbon". Official Journal of the European Union. L 343/11. 27 November 2014. Retrieved 28 November 2014. ^ "Parliament approves new Europol powers to fight terrorism". POLITICO. 11 May 2016. Archived from the original on 23 September 2017. Retrieved 22 September 2017. ^ "Europol's new legal framework a step forward for European policing and security". www.independent.com.mt. The Malta Independent. 1 May 2017. Archived from the original on 23 September 2017. Retrieved 22 September 2017. ^ a b c "Regulation (EU) 2016/794 of the European Parliament and of the Council of 11 May 2016 on the European Union Agency for Law Enforcement Co-operation (Europol)". EUR-Lex. 24 May 2016. ^ "EU, Denmark find deal on Europol after Danes voted to quit". Reuters. 15 December 2016. Archived from the original on 23 September 2017. Retrieved 22 September 2017. ^ "Danish, EU parliaments agree on Europol deal". The Local Denmark. 28 April 2017. Archived from the original on 23 September 2017. Retrieved 22 September 2017. ^ a b "Commission welcomes Europol's new mandate and co-operation agreement with Denmark". europa.eu. European Commission. 29 April 2017. Archived from the original on 29 April 2017. Retrieved 22 September 2017. ^ "Commission Decision (EU) 2017/388 of 6 March 2017 confirming the participation of the United Kingdom of Great Britain and Northern Ireland in Regulation (EU) 2016/794 of the European Parliament and of the Council on the European Union Agency for Law Enforcement Cooperation (Europol)". Official Journal of the European Union. 7 March 2017. Retrieved 29 May 2018. ^ Travis, Alan (18 September 2017). "UK plans treaty to remain inside Europol after Brexit". The Guardian. ISSN 0261-3077. Archived from the original on 20 September 2017. Retrieved 22 September 2017. ^ "Reality Check: Can the UK be part of Europol after Brexit?". BBC News. 20 September 2017. Archived from the original on 22 September 2017. Retrieved 22 September 2017. ^ Stone, Jon (29 November 2017). "Brexit: Britain to be kicked out of Europol against its will". Independent. Archived from the original on 29 November 2017. Retrieved 30 November 2017. ^ "Stop Child Abuse – Trace an Object". Europol. Archived from the original on 22 September 2017. Retrieved 22 September 2017. ^ "Police publish child abuse clues online". BBC News. 1 June 2017. Archived from the original on 29 July 2017. Retrieved 22 September 2017. ^ "Update on Crowdsourcing Europol's "Stop Child Abuse – Trace an Object" Campaign". bellingcat. 15 June 2017. Archived from the original on 20 September 2017. Retrieved 22 September 2017. ^ a b c d e "About Europol". europol.europa.eu. Europol. Archived from the original on 30 August 2017. Retrieved 18 September 2017. ^ a b Bureš, Oldřich (1 June 2016). "Intelligence sharing and the fight against terrorism in the EU: lessons learned from Europol". European View. 15 (1): 57–66. doi:10.1007/s12290-016-0393-7. ISSN 1781-6858. ^ a b c Kaunert; Léonard; Occhipinti, eds. (2015). Justice and Home Affairs Agencies in the European Union. Oxon/NY: Routledge. ISBN 978-1-138-77955-6. ^ "Frequently asked questions". Europol. Archived from the original on 30 August 2017. Retrieved 22 September 2017. The European Police Office is a support service for the law enforcement agencies of the EU Member States. This means that Europol officials are not entitled to arrest suspects or act without the approval of national authorities. ^ Europol Strategy 2016 - 2020. Luxembourg: Publications Office of the European Union. Europol. 2016. doi:10.2813/983718. ISBN 978-92-95200-71-5. Archived from the original on 18 September 2017. ^ European Union Serious and Organised Crime Threat Assessment (SOCTA) 2017 (PDF). Europol. 2017. pp. 10–11. Archived (PDF) from the original on 13 July 2017. ^ Statement of revenue and expenditure of the European Police Office for the financial year 2017 (2017/C 84/35) (PDF). Europol. 2017. Archived (PDF) from the original on 18 September 2017. ^ Kreilinger, Valentin (2017). A Watchdog for Europe's Policemen: The Joint Parliamentary Scrutiny Group for Europol. Policy Paper / Jacques Delors Institute. Berlin. ^ "Meeting of the Joint Parliamentary Scrutiny Group on EUROPOL". www.parleu2017.ee. 22 September 2017. Archived from the original on 23 September 2017. Retrieved 22 September 2017. ^ a b c "Accountability". Europol. Archived from the original on 30 August 2017. Retrieved 19 September 2017. ^ "EU Court of Auditors to assess anti-radicalization programs". POLITICO. 6 April 2017. Archived from the original on 23 September 2017. Retrieved 22 September 2017. ^ "New Regulation boosts the roles of EDPS and Europol". European Data Protection Supervisor. 19 May 2016. Archived from the original on 23 September 2017. Retrieved 22 September 2017. ^ "Operational Agreements". Europol. Archived from the original on 22 September 2017. Retrieved 22 September 2017. ^ "Agreement on Operational and Strategic Co-operation between Australia and the European Police Office (The Hague, 20 February 2007) - ATS 34 of 2007”. Australasian Legal Information Institute, Australian Treaties Library. Retrieved on 18 April 2017. ^ a b "Agreements with International Organisations". Europol. Archived from the original on 22 September 2017. Retrieved 21 September 2017. ^ "Strategic Agreements". Europol. Archived from the original on 22 September 2017. Retrieved 21 September 2017. ^ "Europol and Brazil agree co-operation on cyber crime". ComputerWeekly.com. 11 April 2017. Archived from the original on 22 September 2017. Retrieved 22 September 2017. Carrapiço, Helena; Trauner, Florian (September 2013). "Europol and its Influence on EU Policy-making on Organized Crime: Analyzing Governance Dynamics and Opportunities". Perspectives on European Politics and Society. 14 (3): 357–371. doi:10.1080/15705854.2013.817804. Mitsilegas, Valsamis; Monar, Jörg; Rees, Wyn (2003). The European Union and internal security: guardian of the people?. Hampshire: Palgrave Macmillan. ISBN 978-0-230-50438-7. Rozée, Stephen; Kaunert, Christian; Léonard, Sarah (September 2013). "Is Europol a Comprehensive Policing Actor?". Perspectives on European Politics and Society. 14 (3): 372–387. doi:10.1080/15705854.2013.817808. Santiago, Michael (2000). Europol and Police Cooperation in Europe. New York: Edwin Mellen Press. ISBN 978-0-7734-7731-5. Woodward, Rachel (December 1993). "Establishing Europol". European Journal on Criminal Policy and Research. 4 (4): 7–33. doi:10.1007/BF02249463. Wikimedia Commons has media related to Europol.